India’s is a country where excitement about summer is’nt as intense as spring or autumn.When summer approaches our skin requires major care . 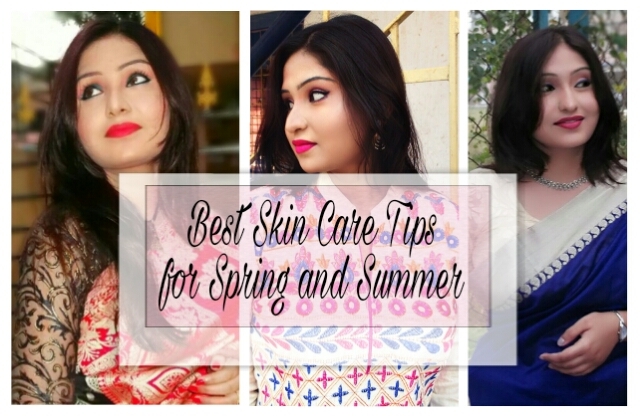 Today I am going to share some handy and natural ways to keep your skin flawless this summer . During spring we need to drink a lot of water ,but when summer finally aproaches plain water is not suffiecient to fulfill our need . As we sweat a lot , glucose and coconut water is definitely going to maintain balance . Wake up and switch to green tea or green beans coffee instead of regular black one . Include raita for lunch if you are not prone to acidity . But not a regular raita , add crushed corrainder and mint leaves to dahi . Wash your face atleast twice and maximum 5 times , exceeding that will drain off the regular moisture and result to imbalance . Your skin will end up producing excess oil and clogg pores and pimples are gonna show up . Understand your skin type and choose your cleanser accordingly . If you are confused ,the parlour lady with help out , encourage her diagnosis not product selling capability .Use a soap free and paraben free cleanser for better result . Toning and moisturizing : Moisturizers are seldom skipped but toner is often neglected . Toning is an important part of skin care routine . You can use green tea stored s ice as toner they work pretty good for early 20 breakout prone skin .If you are in your late twenties try lavender water . If you have more or less clear skin you may not feel the need to use facepack ,but using one will prevent you skin from probable damage and early aging . I recommend sandal wood powder in rose water face pack mixing a bit of fuller earth . Sandal wood prevents tanning , fuller earth has soothing property and rose water is good for skin ,it lightens and softens skin . If you think you face and neck seems tanned try crushing some corriander leaves and apply it on tanned area , trust me it works like a magic wand . For beach tan 3 consecutive days of the treatment works like magic . Try to mix two tea spoon turmeric with 1 table spoon yogurt .then add 4-5 crushed mint leaf and a pinch full Saffron . It will not only work for uneveness , but will kill pimple causing bacteria , saffron will add glow to skin and turmeric will fight apparent tan . I would recommend you all to try this after sunset ‘cause if you step out into the sun after using turmeric your skin will be prone to sunburns more than normal . Yogurt will provide you balance moisturization . Do not skip greens , it is completely ok to consume non-veg as much as you like but somewhere there should be balance . Do not skip greens . One green sabzi that you should include in your diet during this spring –summer transition perioud is fenugreek ..you can try out different recipe with fenugreek leaf . My mother cooks a fabulous one I’m gonna share the recipe with you all real soon . Keep you hair dirt and dandruff free , these factors secretly contribute to many major skin problems ,but we hardly count . Get adequate sleep , sleep early and wakeup early this will not only improve your physique but skin too. Stick to aquabased primer , foundation avoid thick ,pore clogging makeup . If you have no option use it but make sure you take them off when you don’t need them anylonger . If you use thick coverage makeup during day time take care of you water consumption . You need to increase that ,even if that results to visiting wash room frequently . Wipe your phone screen guard with with anti bacterial wipes , change pilow cases and bed sheets pretty often . Keep following us and keep spreading love ..